We’d love your help. Let us know what’s wrong with this preview of As Long as We Both Shall Eat by Claire Stewart. To ask other readers questions about As Long as We Both Shall Eat, please sign up. This started as a good idea. And that's where it should have stopped. The writing is all over the place. Following paragraphs don't match the preceeding paragraph i.e. completely different subjects. Section titles have nothing to do with what is written in the section. Heck, whole chapters have nothing to do with chapter titles. It feels like the author read some books and then wrote this book. This book is all over the place and has little to do with the subject she allegedly is writing about. The research is poor or nonexistent. There are incorrect and even racist terms used i.e. Islamists instead of Muslims (Muslims are followers of Islam while Islamists are terrorists who use Muslim theology fashioned into an ideology of hate and violence). The author should stick to cooking and not write about history. Started out as an interesting concept, and I always enjoy a good exploration of folklore and tradition. Unfortunately, this book began scraping the bottom of the barrel about halfway through in a quest for more material, and it shows. Also, the aforementioned “Islamists” misnomer and a reference to “snowflakes “ did it for me. Avoid, avoid. If you need reference material on wedding culture for any reason, I can name about five different books you’d be better off with. 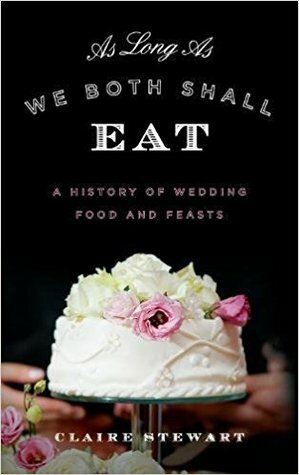 This book had some interesting insight into the history of the the way weddings and food are intertwined. However, the author jumped from topic to topic manically and it was difficult to follow. Overall, it was interesting but not as well written as it could have been. Fairly interesting book, but it wasn't about wedding feasts. Too bad they didn't re-think that title. I'm sure there were some disappointed readers. Part history, part folklore, part sociology. Sadly does not include any recipes. I loved this book! It was well written, interesting and enjoyable. Ms. Stewart includes many wonderful cultural traditions and presents them beautifully. This is a fine resource for those doing research in food studies.